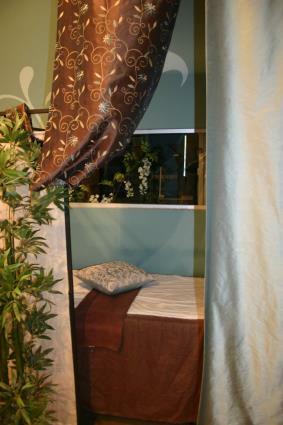 The care of our clients extends to our selection of unique spa services. Our research has led us to the latest treatments that will assist you in ensuring your pet lives a healthy, peaceful life. Skin is an animals largest organ and requires special care. Exfoliating speeds up the process of shedding and flaking by removing the uppermost layer of skin. The process aids in circulation through stimulating blood flow which relaxes and reduces stress. Imported mud from the Dead Sea is massaged into the coat, down to the skin. 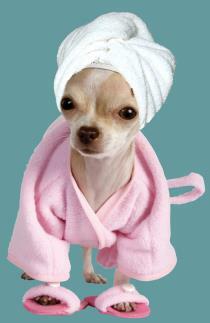 Your pet is then wrapped in a warm towel for 15 minutes. This process will actually draw out toxins and relieve itchy, irritated skin. Made with clay minerals enriched with Jojoba, Olive and Macadamia Oils, this treatment nourishes and helps detoxify the skin, while producing a coat that is hydrated, revitalized and radiant. Saturated with a high-quality deep conditioner and wrapped in a warm towel, this treatment will add suppleness and elasticity back to the skin and coat. Not only does it make their face bright and clean, but the amazing scent is Aromatherapeutic which calms and relaxes the bathing pet. The sensitive foot pads on our pets help regulate body temperature and are extremely important. Cells are regenerated while sloughing off dry, rough skin. Shea butter and Aloe are natural skin-healing agents and this 100% natural balm helps treat dry, irritated skin. It's great for dry cracked pads and keeps them soft and supple. Reduce shedding up to 90% in one treatment. The first step is the shampoo which promotes healthy skin. The deShedding solution then helps release the undercoat. A tool created especially for this process then removes the remaining fur and leaves the coat smooth and silky. Enhance the natural color of your pets coat. This series of shampoos cleanse in the kindest way possible while leaving a mere trace of color. The support conditioner then leaves shimmering color with a brilliant luster. All of their products start with the finest organic, ultra-pure, cosmetic grade shea butter from the Nile basin. Skin conditioning botanical extracts and natural essential oils are added to promote healthy skin and offer fast relief for many skin conditions. Accent just the tail, or really go crazy and have your pet make a statement! We have a rainbow of semi-permanent hair color made especially for dogs. For that finishing touch, add a little color to the toenails. Formulated for dogs, these colors add a little pizzazz to your furry friend. Freshens the breath and helps keep away plaque build-up. Trained in IPT and Certified as an Animal Massage and Care Provider, we use massage to release tension, gain animal permission, promote well-being, and mutual respect. It can help rescued pets regain trust and affection. IPT also stimulates oxygenated blood to flow through muscle and connective tissue which allows toxins to flush from the body.